‘When there were three people in every seat, we ran the film,’ director Perry Henzell recalled. And of course that’s when the real excitement began! People laughed and shrieked, cursed and cheered as they watched the story of Ivan O Martin, the country boy who comes to town to find fame and fortune, and instead finds himself face-to-face with corruption and injustice. Ivan (spectacularly performed by Jimmy Cliff) eventually abandons his dreams of making it in the music industry and begins to make a living as a marijuana distributor in the ghettos of Kingston. Things take a turn for the worse when Ivan (who is loosely based on Rhygin, the hugely feared but widely revered criminal/ folk hero of the 50s) shoots a policeman, and turns into a fugitive. However, Ivan soon becomes a hero amongst the Jamaican people who admire him for the cunning ways in which he repeatedly eludes the authorities. During the final scenes, when Ivan is eventually surrounded by a team of army soldiers, the crowd in the Carib theatre cheered on the protagonist and gasped in horror as they watched him meet his untimely (but inevitable) death under a hail of bullets. As the curtain fell there was roaring applause as Jamaicans expressed their pride and gratitude at finally having been given a voice on the Big Screen. ‘It was every director’s wildest fantasy,’ Henzell concluded. Although the story still remains highly relevant today, it was especially topical at the time. The film’s dramatic narrative, teeming with revolutionary spirit, spoke strongly to the people of Jamaica in an epoch when the country was holding its breath and hoping for its own revolution. In the 1970s, Jamaica had only known independence for a few years but already Jamaicans were being confronted with disappointments: rather than the new egalitarian country people had aspired towards, Jamaica under Jamaican rule continued to reflect the power inequalities so deeply entrenched under colonial rule. People were becoming increasingly disillusioned and frustrated with the country’s rulers and authorities. The Harder They Come is a gritty, realist film that depicted Jamaica as the majority of Jamaicans knew it. Shot largely through hand-held cameras in a poignant documentary style, it exposes the harsh realities surrounding life in Third World countries that many filmmakers, before and after Henzell, have preferred to ignore. The film was heralded as the best film ever to have emerged from the Third World, and still remains an exemplary model for filmmakers today. However, the overall effect of the film is not bleak, depressing, or degrading. No, the moving picture captures the strength and resilience of the Jamaican people in a way it had never been captured before. The film embraces Jamaican culture, providing an insight into both the beauties and the atrocities that exist on this Caribbean island. Abroad, people identified with the revolutionary outlook of the film and were drawn to its raw energy, in particular its depiction of the indomitable spirit of the Jamaican people. This seminal moving picture boosted the Jamaican culture onto the global scene and was instrumental in the subsequent success of Jamaican music in the international market. 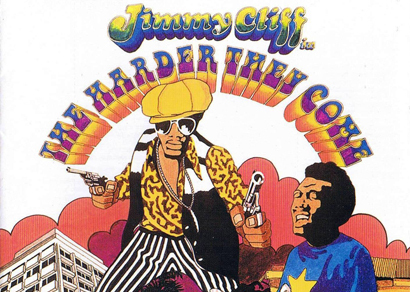 The film’s excellent soundtrack provides the perfect introduction to Jamaican music, containing explosive hits such as Desmond Dekker’s 007 (Shanty Town) and The Maytals’ Sweet and Dandy as well as the classic Cliff songs: You Can Get It If You Really Want, Many Rivers To Cross, Sitting in Limbo, and the brilliant eponymous title track. The Harder They Come is a film of outstanding quality that was superbly written, acted, filmed and produced. However, the success of a film is also a reflection of its makers, and none of the above would have been possible if it had not been for the solid work that went into creating the film. From its inception, the project encountered endless obstacles. It seemed that Henzell was attempting the quasi-impossible; he was attempting to create a Jamaican film at a time when there was no belief in a Jamaican film industry. It was almost impossible to obtain funding. Many of the cast and crew members worked on the agreement that they would be remunerated once the film was released, and on several occasions the production had to be halted for lack of funding. When it came to promotion, Henzell had to single-handedly travel to numerous countries across the globe to promote his film and ensure it was given due recognition by the press and the public. The end result is an inspirational chef-d’oeuvre that, despite its tragic denouement, proves without a doubt that with courage, passion and determination you can get it if you really want!